After 3 months of shooting 360 videos and photo/videogrammetry over the Summer, Dan is now currently back in Colombia, leading the second part of the project. This part focuses on a “socialization phase” in which we organize an event in each of the communities we met and worked with originally, showing them the stories we produced in their area, as well as showcasing the other dozen or so from all over the country. 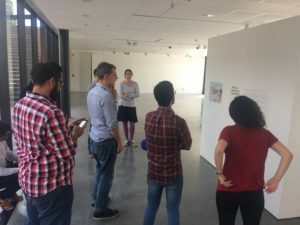 The trip to Colombia kicked off with an exhibition at Bogota’s Centre for Memory, Peace and Reconciliation on Sept 11th and ran for that week, featuring a hands-on workshop where attendees learned how to plan, shoot and edit 360 video. The exhibition itself was comprised of two parts: a 360 video section and a room-scale Vive section. The first worked through series of sketches of the 10 different interviewees featured in the videos, which served as augmented reality triggers. Users were prompted to download our AR app, ARc Stories, which then drove them to the respective Youtube 360 video when they pointed their phones over it. A similar dynamic to the one we used to showcase Positive Negatives’ amazing exhibition recounting refugee stories of exile, A Perilous Journey, at the School of Asian Studies (SOAS) in May. We agreed with our partners, the Centre for Historic Memory, that this would be the best way to showcase all the 10 different 360 videos without haranguing people with URLs (as 90% of people were using their own phones). Yes, we did run into some connectivity issues, but those were quickly solved with router swap outs, and the experience generated some great conversations around using new tech to kickstart differenc conversations around the peace process and historic memory. The second part of the exhibition, El Salon de Nunca Mas, featured a room-scale reconstruction of the memory house (casa de la memoria) built in Granada, Antioquia, for users to explore using the HTC Vive. This was new to 99% of the visitors to the exhibition, and generated some genuine shrieks of astonishment and a bevvy of questions from most who got to check it out for 15 minutes. The space was perfect for setting up a 3m x 3m area, though we were swarmed on the second day by a few huge packs of school children who gathered around the laptop screen to see what the viewer inside the Vive could see. 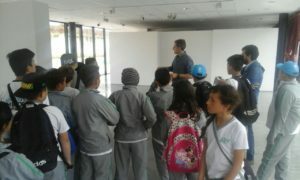 Although 360 video is definitely making its way around Colombia as a new type of emerging media (naturally in the largest cities, Bogota and Medellin primarily), room-scale VR still remains unchartered territory, and we were delighted to be able to be the first to show excited crowds in Bogota a new way of using this tech to transport them to Granada and reframe the narrative around spaces of historic memory.